"When the Ben and Jerry's ice cream company kills a flavor, it's treated with respect." They even have a small little poem for the Rainforest Crunch! "With aching heart and heavy sigh, we bid Rainforest Crunch goodbye; that nutty brittle from exotic places got sticky in between our braces. 1989-1996. It was a really, really good flavor." 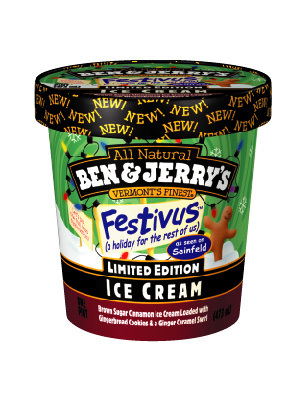 This morning I also learned there was a 'Festivus - A holiday for the rest of us' Ben and Jerry's edition! Too bad I will most probably never get my hands on a pint of it. Rest in peace sweet awesome flavours. Fun fact, Googling for 'Festivus' gives a nice few of easter eggs! Get in my face, a Festivus miracle! Posted in Entertainment and tagged with Ben and Jerry's, Ice cream, Graveyard, Epic, Festivus. February 7, 2013 by Emiel Sondag.